Add aclassical feel to your garden and home with our Vintage Garden Planter.Suitable for ornamental shrubs and other garden classics such as Roses andBuxus, it boasts an excellent soil capacity to ensure that roots have space tothrive. Thisproduct has been designed to authentically replicate rose gold and old silver,whilst being lightweight and durable due to being manufactured in premium metaland double galvanized. Create anelegant focal point in your garden with the vintage family. Our inspiration forthese products comes from the architectural styles popular in RenaissanceEurope. The bolddesign complements the natural metal finish, resulting in a family of productssuited to many garden settings. For an impressive floral display, theseplanters are especially suited to vibrant garden classics like Roses. 【MEASUREMENTS】13" Wide by 11" Deep, Quantity: 2. 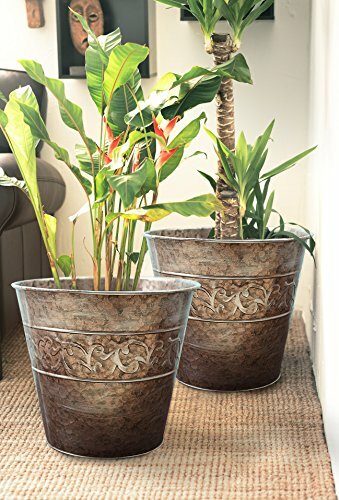 【UNBREAKABLE & SOLID &DURABLE】Unlike other tin planters, we use thick metal tin to make this planter unbreakable and solid, which can serve at least 4 years in your garden. 【Indoor/Outdoor Vintage Décor】Add a touch of rustic charm to your home with this galvanized pot. Its patterns are heavily influenced from nature. 【NON-FADING & SUNFAST】With double galvanized tin and high quality zinc, they can withstand extremes of temperature and weather without fading or cracking and the color will remain rich for many years. 【RUST PROOF】To withstand all the elements, this planter has been specifically designed to last well throughout the colder months and hotter days. They will not rust or break in any environment.